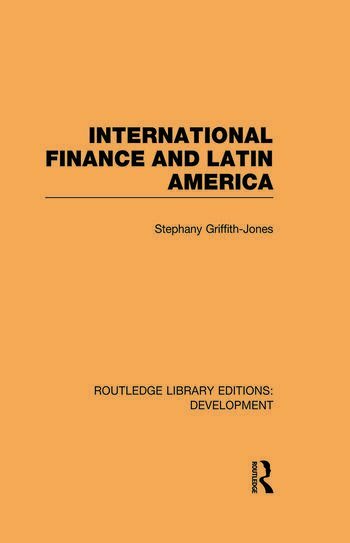 This reissue, initially published in 1984, examines the evolution of international financial flows to Latin America since 1945, along with their implications for National Development . The book describes how, in each of the first three decades since the war, a new agency emerged (foreign investors in the 1950s, official aid agencies in the 1960s and multinational banks in the 1970s) which was willing to play a dynamic role in generating new financial flows to the region. The lack of such an agent in the 1980s, combined with a reluctance on the part of former investors to maintain their level of assistance culminated in an economic debt crisis in Latin America which this work seeks to address, asking the crucial question: what measures should be taken – both nationally and internationally – to deal with this critical issue , in a way that will both encourage Latin American Development and avoid a major international financial crisis?